Trying to eat healthily isn't easy when you need convenience. Make hot pockets at home for a quick meal on the go without processed foods. For the last few years now, we have been trying to eat healthier and be careful about how many processed foods we buy and consume. There are some foods, though, that are convenient to have around, so we have started to try making some of them at home. This time, we decided to try to make some hot pockets at home. I haven’t had any of the store-bought ones for a long time, but it just sounded good. I’ve always liked the ones that are filled with ham and cheese, so of course, that was one that I made. And the pizza ones always had pepperoni in them, which I don’t like, so I wanted to make my own cheese pizza hot pocket while we were at it. Since we had enough dough to make 4 different hot pockets, Justin picked the other ones. He recently bought some salami to make sandwiches, so requested a salami and cheese one, and a breakfast one. For two of the hot pockets, I tried to make them the traditional rectangular shape. They tasted good, but it didn’t work as well. For the other two, we tried to make it them braided in the same way as the Cheesy Chicken and Stromboli Ring. Even though they all were delicious, I preferred the braided ones because the dough was thicker and the filling wasn’t spread as thin. And, they looked pretty! 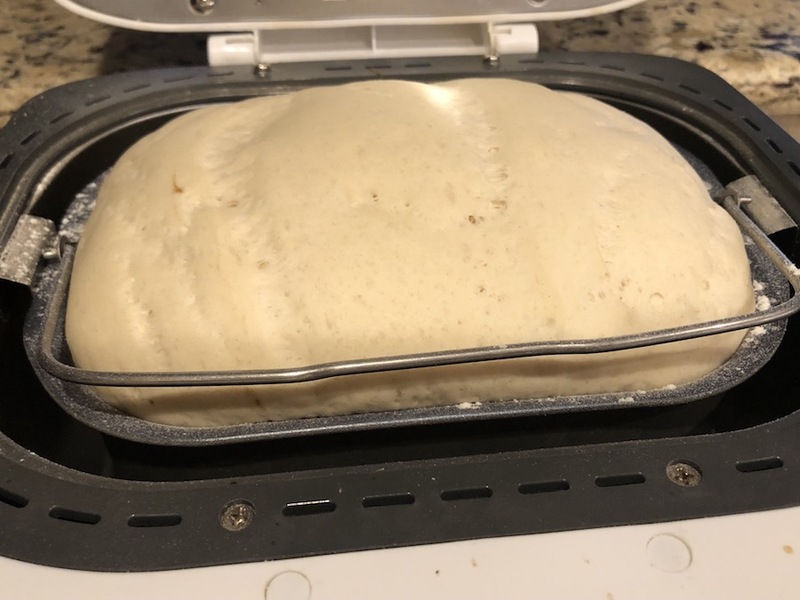 For the homemade hot pockets, I started by making the dough that I use for making Homemade Pizza in the Bread Machine. I love making this dough because it’s really easy to make, and I always have the ingredients on hand. It takes an hour and a half for the dough, but you just have to add the ingredients, set the bread machine, and let it do its thing. Once the dough has finished, roll it out on a floured countertop. I never knew how much dough this makes because when I make pizza I don’t spread it near as thin. But roll the dough until it’s only about 1/8-1/4 of an inch thick. Use a pizza cutter to cut the dough into fourths. Since I was trying two different methods, I did two pieces that were square, and two that were rectangular. If you are going to do the braided hot pockets (which I recommend) then you want to cut it into squares. Add your fillings in a line to the center of the dough for the braided method, or to the center of only one half if you want to fold them over. Shape the dough in the way you want them to cook. If you are doing a braided pocket, then use the pizza cutter to cut the dough into diagonals and fold it over towards the opposite sides. For the folded sandwich, fold the top half of the dough over the bottom with the filling and use a fork to seal the edges. Move the hot pockets to a pan and cover with an egg wash. It’s not always easy to move these once they are filled, so it helps to make them on parchment paper. Bake the hot pockets for about 20-25 minutes, until they are golden brown. Trying to eat healthily isn’t easy when you need convenience. Make hot pockets at home for a quick meal on the go without processed foods. Note: Nutrition information is calculated for the hot pocket without fillings since there are multiple ways to make them. I haven’t had a hot pocket in awhile. I hate making bread because yeast and I never get along but maybe I need to try again. These look good and hot pockets offer endless possibilities. I’ve only ever made bread with yeast in it, but I’m sure there are alternatives as well. You would need just any type of dough for these plus whatever fillings you want. These look delicious, I think even my son would eat ond! I wish I knew to make dough, but I think I could try this with crescent rolls or pie crust. I’ve never tried anything like this with pie crust, but I’m sure it would work well with crescent rolls or a refrigerated pizza crust! My husband would love these! I hate buying hot pockets or things like it but making it myself so I could be aware of the ingredients would be fantastic! That is exactly why I like making them myself as well! We have been trying to really cut out processed foods the last few years. This is exactly the kind of after school snack my kids enjoy. I can’t wait to make these myself so I know exactly what the ingredients are! They are perfect for after school! We had them for dinner, lunch, and snacks at our house! Yummmm! I havent had hot pockets in forever! When i was a kid i LOVED ham hot pockets. The salami one looks delicious too, btw! Same here! I can’t even remember the last time I had one and it sounded so good. So we decided to make our own. Oh yum, these all look amazing! The pizza one really made me want to try this out! Probably way better for you than the frozen ones too! Oh my gosh, so much better! And I think they had more flavor as well. I never had the pizza frozen ones because they always have pepperoni and I don’t like pepperoni. Another reason I love making things like this for myself! Homemade hot pockets. Yum! These look so delicious! Thank you, they were so yummy! I think I would love to try any of those ways when it comes to this dish. It does look so incredibly delicious. And I think it would be great to do something like this with my daughter because it would be so fun. It’s definitely a recipe that’s fun to cook together. You can both choose your own fillings and experiment together with it all. There are so many different flavor combinations you could try! These were just the 4 that we decided to try based on our tastes and what we had at home. I hope you enjoy!! Hot Pockets are one of our favorite go-tos for lunches. These look like they would be so amazing to make and have as a homemade version. My boys loved them for both lunch and snacks! They are perfect to cut up and save for later for a much healthier option that you can customize to your individual tastes. Uhmm. Looks yummy and so easy to do. Should I be trying out this recipe? Thanks for sharing it. Hope I can do it. They are fairly easy to make, and create a lot so you can have leftovers for the next day as well! Great ideas. My sons love hot pockets. The store bought ones are not too tasty to me and w these I can Add veggies to it.